For awhile now I've considered, debated and thought about venturing into being a vegetarian. It's mostly for animal-rights reasons and part of a larger effort I'm making to pursue more cruelty-free/vegan products for things like beauty and cleaning. I've also considered it for health reasons as well since heart disease runs rampant in my family and eliminating meat is a step towards health from a heart-perspective. So, I decided that from today through June 5th (4 weeks) I'm going to attempt to not eat any sort of meat. In theory, I'd like to also try to eat fewer carbs but I'm worried that if I try to do too much at once I'll fail. So I'll be quasi carb-conscious...especially at dinner...and 100% meat conscious. I've decided that a lot of my favorite meals/foods/dishes (think pasta dishes, soups, etc.) 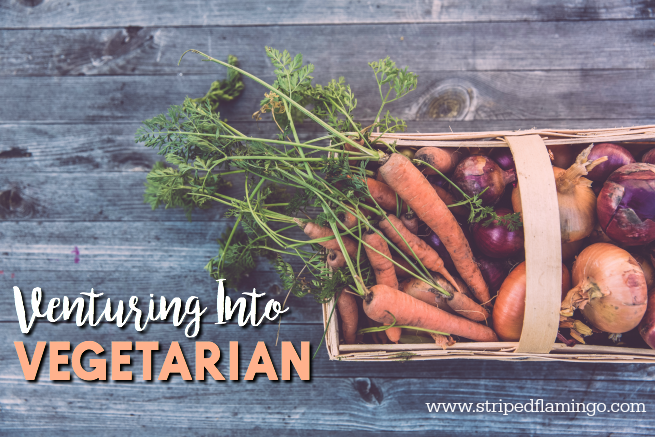 already are or can easily be made vegetarian so this will be helpful in meal planning. But if any of you have any vegetarian-friendly recipes or meal ideas, I'm all ears! Even if it's something I could omit the meat from. Ready? GO! Let me know if you find any filling, not too bad for you vegetarian keeper recipes please!